So, I decided to join a little group called Foodie Friends Friday. Basically, a group of food bloggers get together every Friday and send a little foodie love by posting a recipe from one of their friends. Today, I've chosen Bridget from What's Cooking in the Burbs because she had a creative take on a cheeseburger. 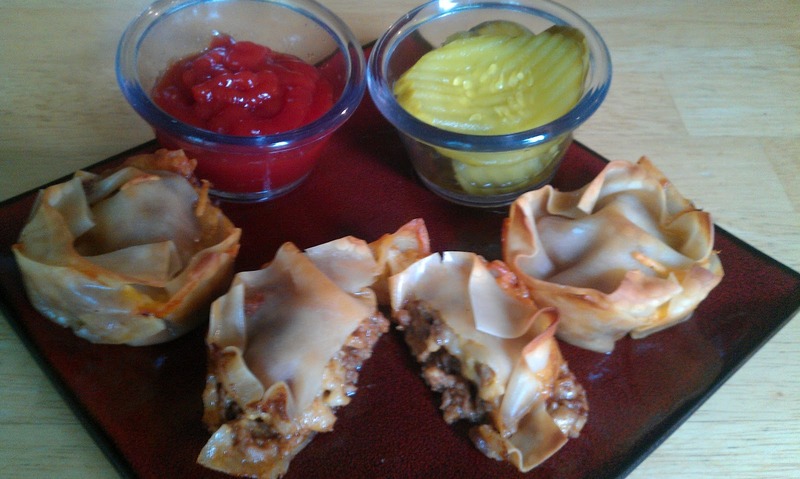 She took leftover wontons and ground beef and fashioned it into a cute muffin sized cheeseburger bite. And as I'm a total sucker for anything adorable, I thought it would be a fitting first foodie friends friday. The website for Foodie Friends Friday can be found here and Bridget's blog can be found here! First, brown and drain the ground beef. Return the ground beef to a pan, add the water, vinegar, worcestershire sauce, ketchup, mustard, 1/2 cup of the shredded cheddar, and garlic, and simmer over a low heat until combined. Preheat the oven to 375 F. Spray muffin cups with cooking spray and line them each with one in each cup (12). Add the meat mixture, top with the additional cheese, and cover each with another wonton wrapper. Bake at 375 F for about 15 minutes, until the wrappers are golden brown. Serve up with your favorite burger condiments and enjoy! Great idea. I will try this whit cabbage inside on the wonton.This recipe is very original and exotic hehe.